On March 31, 307 AD, the daughter of Maximianus, Flavia Maxima Fausta, married one of the caesars of the Tetrarchy – Flavius Valerius Constantinus (Constantine the Great). 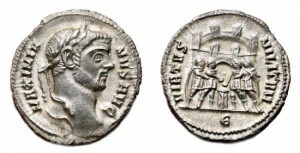 The marriage was politically motivated, allying the rebels Maximianus and Maxentius in Italy with Constantine in Gaul, against Severus II for central Europe. 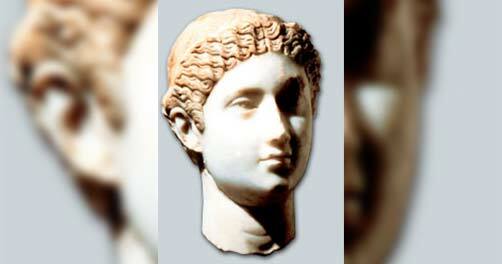 Before the marriage to Fausta, the status of Constantine is unclear – he had a relationship of some kind with Minervina, the mother of Constantine’s son, Flavus Julius Crispus. Whatever the relationship was, Minerva and Constantine didn’t associate with each other after his new marriage. You will a Constantine Coins selection at the bottom of this post. Fausta and Constantine were wed during a tumultuous time in the Roman Empire, as the Tetrarchy was in upheaval. Constantine was climbing the ranks while all of the caesars and augusti were fighting each other for power and territory, and Constantine was out fighting the external enemies of the empire. As the rival caesars and augusti eliminated each other, things finally worked out to where in 313, only Constantine I and Licinius I were left as co-rulers. This allowed Fausta to start traveling extensively with her husband during the very long period of the Licinian Wars. She gave birth to their first son, Constantine II in 316 while in Arles. In 317, she gave birth to Constantius II in Illyria. 320 or 323 brought the birth of Constans in Constantinople. Their daughter Constantina was born before 317 and their other daughter, Helena the Younger was born later, but the date in unknown. In 317, Fausta was given the title nobilissima femina, the same title held by Constantine’s mother, Helena, until she was declared augusta in 323. All throughout the life of the family and the rule of the empire, Crispus was growing in fame resulting from his military successes. The problem was that Crispus was a threat to Fausta’s children as he was Constantine’s legitimate son and first heir. Fausta needed to get rid of him to secure the futures of her own sons, so she accused Crispus of some sort of crime, the exact details of which are unknown. She did manage to convince Constantine she was telling the truth and Crispus was sentenced to death. He was executed in August or September 326. Fausta’s personal victory would be short-lived, however – Constantine, discovering the truth, or because he later was filled with guilt, sentenced Fausta to die for her treachery. She was executed via suffocation in an over-heated bath later in 326 and Constantine declared a damnatio memoriae against her. Since Crispus died while Constantine was still alive, he never was declared higher than caesar, as Constantine would not share his title with anyone. Each of the sons would become augustus after his death, Constantina would marry Hanniballianus, then Constantius Gallus and Helena the Younger would marry Julian II. Constantine had hoped after his death that all of his children could peaceably co-rule, although it was not to be.